JERUSALEM (Ma’an) — Several Palestinians were detained and checkpoints were set up at the entrances to Palestinian neighborhoods on Wednesday as Israeli officials launched punitive measures across occupied East Jerusalem following a string of attacks. Israeli forces raided the al-Issawiya and Jabal al-Mukabbir neighborhoods early Wednesday and detained 12 Palestinian students from the area, locals told Ma’an. The detainees were identified as Sameer Obeid, Ibrahim Obeid, Jalam Omran Dari, Muhammad Mustafa Dari, Medhat Obeid, Sameer Muhamamd Obeid, Ramzi Ahmad Owisat, Eiad Atta Owisat, Ehab Shafiq abu Dhem, Nadir Naji Owiast, Akram Mustafa Dari, and Mahmoud Owisat. Israeli forces set up checkpoints at the entrance to the al-Issawiya and al-Tur neighborhoods, Muhammad Abu al-Hummus, a local follow-up committee spokesman, told Ma’an. Al-Hummus added that the forces were issuing citations to Palestinian drivers at random. Israeli security also inspected several Palestinian youths and students in “humiliating” ways, forcing them to take off their clothes, he added. 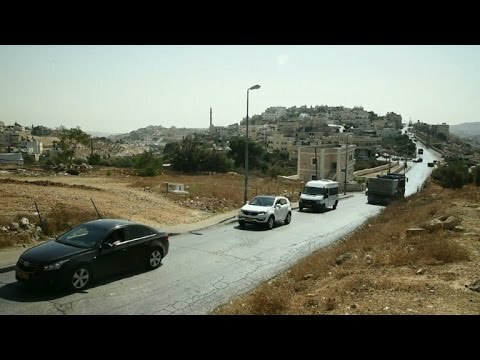 Israeli forces have also been deployed in and around the Old City in a bid by Israeli authorities to curb rising violence in the city. Locals told Ma’an that Israeli troops raided Al-Aqsa Mosque compound when right-wing Israelis entered the area through the Dung Gate. Sixty “black-listed” Palestinian women were also barred from entering the holy compound. An Israeli police spokesperson had no comment on Wednesday’s security measures. Earlier, Israel’s security cabinet announced that Israeli police are now entitled to “impose a closure on, or to surround, centers of friction and incitement in Jerusalem, in accordance with security considerations,” according to reports by Israeli news site Haaretz. The cabinet also gave approval for the revocation of residency status for Palestinians who carry out attacks as well as the police closure of occupied East Jerusalem. Israeli army reinforcements are being sent to aid police in cities and main roads, and 300 security guards are expected to be stationed on and around public transportation. Late Tuesday, Israeli forces detained Shoruq Mazru,15, from the Shufat Refugee Camp and four Palestinians from al-Tur and Silwan neighborhoods. Head of the Jerusalem detainees committee Amjad abu Asab said that Israeli troops also detained five Palestinians from Ranana east Tel-Aviv. Two of the detainees were identified as Salah al-Basti, Majd al-Basti, and Tariq Abdeen. Israeli rights group B’Tselem has called the Israeli government’s response to recent escalation in the area as “the very inverse of what ought to be done” in realistic efforts to stop current violence. At least seven Israelis and 30 Palestinians have been killed in violence that has escalated since the beginning of October. Three-hundred and sixty Palestinians have been shot with live fire, 932 with rubber-coated steel bullets, and 2,365 have been injured by tear gas since Oct. 1, the Red Crescent said. Dozens of Israeli have been injured in Palestinian attacks, mainly stabbings.